Seagate Backup Plus Ultra Touch review: It's a hard drive! It's a carpet sample! 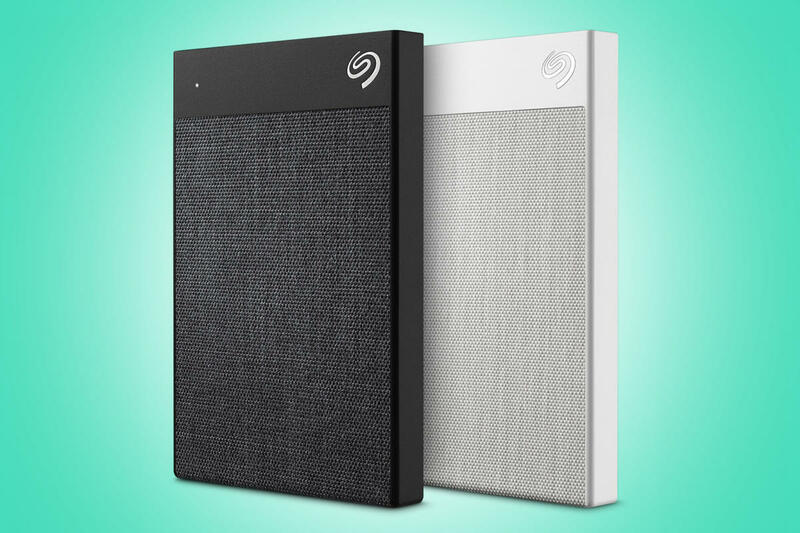 Though my review title makes fun of the basket-weave polyester fabric covering a goodly proportion of Seagate Backup Plus Ultra Touch's upper surface, in truth (and in my opinion) it's a very attractive drive. Perhaps more so than a lot of competitors. Alas, while you might think that the textured material would provide more grip, it seemed that there's actually a bit less. Go figure. Regardless, it's an attractive, svelte drive, and a very good performer that you should consider even if your tastes run contrary to mine. There's rarely much to talk about design-wise with an external drive, so the the fact that the top of the Ultra Touch is carpeted—excuse me, covered—in a polyester basket-weave immediately makes it distinctive. I quite like the look, but taste is subjective. As to the technical details, the Ultra Touch is a 2.5-inch external USB 3.1 (Gen 1/5Gbps) hard drive available in 1TB (the capacity we tested) and 2TB capacities, and either black or white. Seagate sent me the white 1TB model, so my comments on the unit's relative beauty cover only that. The unit measures approximately 4.5 x 3 x 0.45-inch thick, and weighs a little more than 5 ounces. Put another way, it's thin and light. The Ultra Touch sports a SuperSpeed Micro-B port on board rather than Type-C. However, there is a Type-A to Type C adapter included for the Micro-B to Type-A cable. Yes, it covers the ABC's of USB. 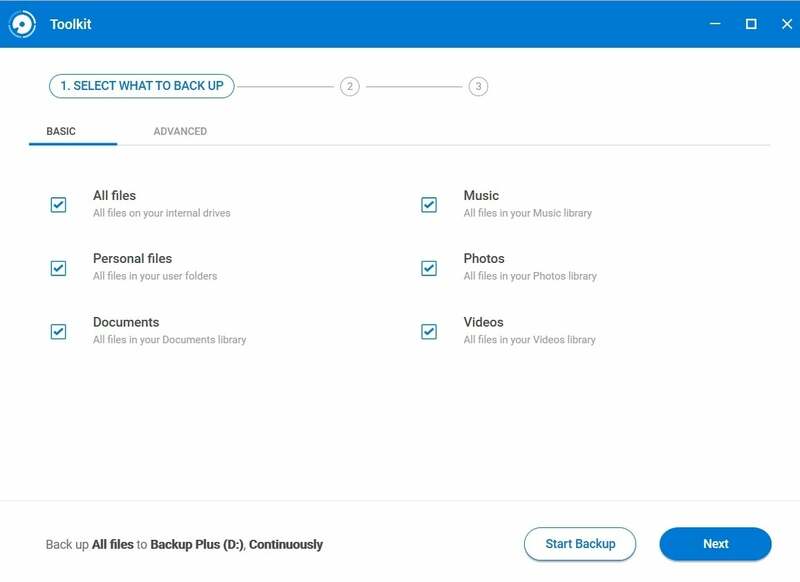 Seagate also bundles its ToolKit backup/utility software and a year's subscription to the Mylio online photo aggregator (from multiple online services such as Facebook, etc.) and organizer. But they're not actually on the drive. You run StartHere.exe to go online to complete a registration process and get your software. Both programs are nicely rendered and quite capable, but I'm not a fan of being forced to download essential software or being upsold non-essential software. Seagate ToolKit is a competent file-level backup utility, but you can skip the the mildly annoying download experience if you're already set. The online "wizard" also shills online data recovery plans. Note that there is no 100-percent guarantee that data can be recovered from a hard drive, though the success rate is exceedingly high. It depends on the nature of the failure. The price for Seagate's data recovery service is $10 for two years, or $15 for three years. Why not just $5 a year, I couldn't tell you. You might consider just keeping the drive backed up (check out our backup software reviews for recommendations), especially considering that the warranty is only two years. 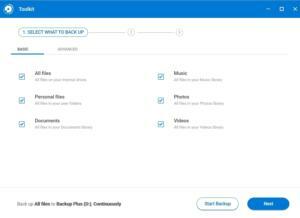 ToolKit does file-level backup very well, and it's easy to use. My only, exceedingly minor complaint is about the very thin sliders on the file panes, which require far more precision with the mouse than they should. Note to designers: Follow the Microsoft Windows design guide and stop trying to reinvent the wheel. MyLio is a attractive and capable photo/calendar aggregator. A one-year subscription is provided with the Backup Plus Ultra Touch. 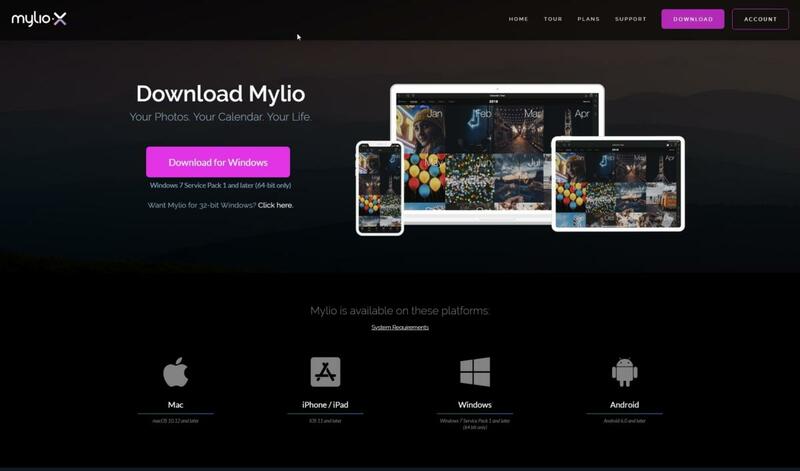 Mylio is a fascinating and probably useful-to-many app that connects your online accounts to gather your photos, and also uses any calendars you may have to timeline them. Not the way I roll, but its features will undoubtedly appeal to many with a more mobile lifestyle. Overall, the Ultra Touch (orange bars in the charts) garnered nice numbers in CrystalDiskMark 6 and AS SSD 2 (just the throughput and access times), as well as our real world 48GB copy tests. It was just a tad slow reading smaller files, but it was ace with the single large file, and overall as speedy as the competition. Seek times indicate how fast the drive can locate and reach a piece of data on the drive.The seek test results in AS SSD that you see below, were a bit slower then normal, especially the write, which would explain the very mild sluggishness reading the 48GB smaller files and folders. 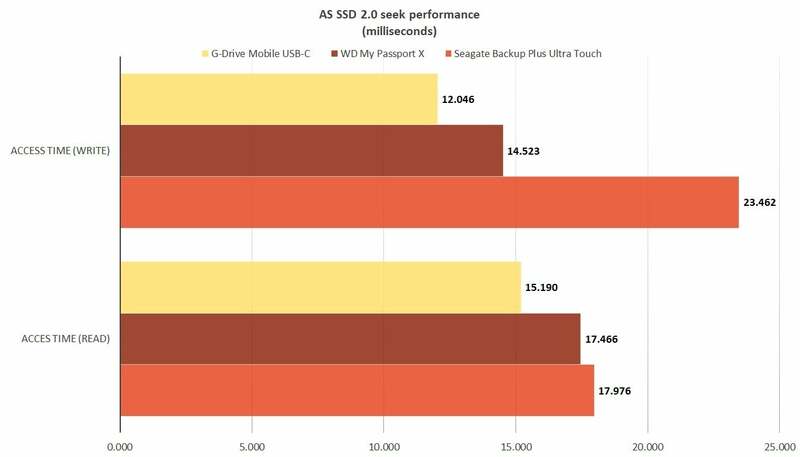 The Touch Ultra's write seek times are pretty slow, but don't correlate to the real world performance with our 48GB data sets, which was overall on par with the competition. Shorter bars are better. 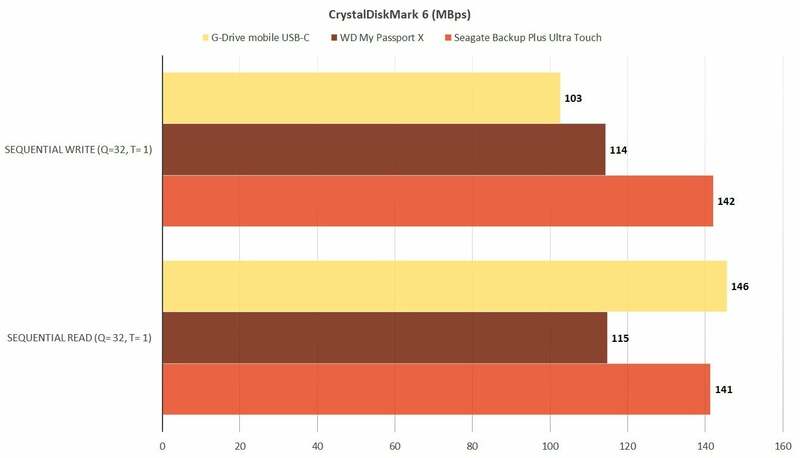 As you can see below, the Ultra Touch rocked CrystalDiskMark 6, handily defeating its G-Drive mobile USB-C rival with its mysteriously slow writes, and spanking the WD My Passport X. If you ran only synthetic benchmarks, or copied large files, you'd be more than pleased with the Touch Ultra's performance. Longer bars are better. As mentioned, the Ultra Touch is somewhat less spectacular with smaller files and folders, though the deficit was nowhere near what the seek times might have portended. 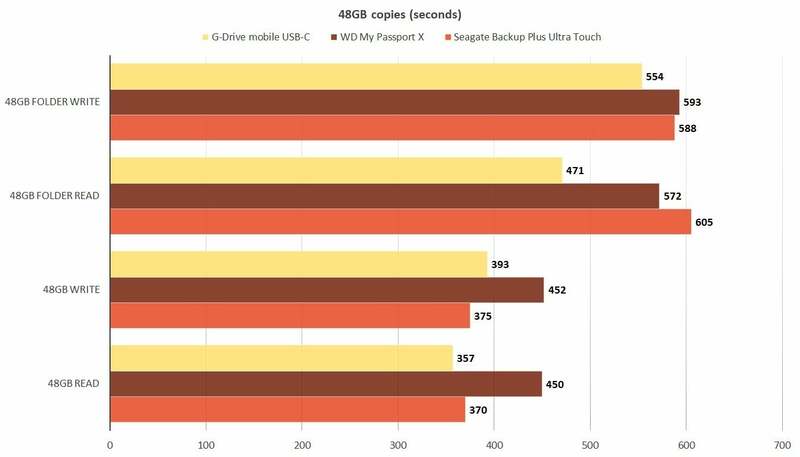 The Ultra Touch was a bit slower than the others with smaller files, but wrote our large 48GB file slightly faster than the competition. The Seagate Backup Plus Ultra Touch gives you plenty of performance in an attractive package, though attractive is very subjective thing. It's also light in your hand and priced competitively. What's not to like? This story, "Seagate Backup Plus Ultra Touch review: It's a hard drive! It's a carpet sample!" was originally published by PCWorld. Slim, attractive, and fast (for a USB 3.1 hard drive), there's really nothing we dislike about the Backup Plus Ultra Touch except being forced online to download the bundled software.